It is nice to wake up to so many posts of gratitude and good wishes. Allow me to add to them and to wish all of you a happy, peaceful, delicious day (that includes a Steelers victory) and to express my thankfulness for my family, friends, a roof over my head, food on the table, coffee, a job, and a song in my heart (as well as the Steelers, Pens, Pirates, Penn State, and Pitt).Here is hoping that each of you can find something to be thankful for. Gobble, gobble! 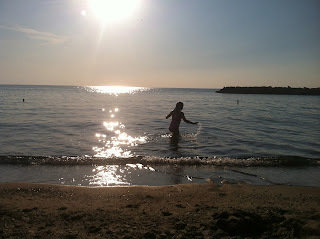 I thought I would post some pics from a quick trip to Erie I took with the kid and my mom in August. I can never take or have enough pictures of the water and the sun. The water was really cold, which I thought it might not be as bad since it was just past mid August. But that did not stop the kid from swimming. Me? I made it to thigh deep water and chickened out. One of the coolest thing about the Bicentennial Tower was there were hundreds, maybe even thousands, of bricks engraved with people's names, scattered along the walkway that you see in the photo above as well as in and around the Tower building. After we came back down from the top of the tower, we got ice cream. And I was sitting there eating, I happened to notice a brick with the names of a family whose kids go to my kid's school. Small world, I say. I really enjoyed our time at the Thomas Ridge Environmental Center (TREC).